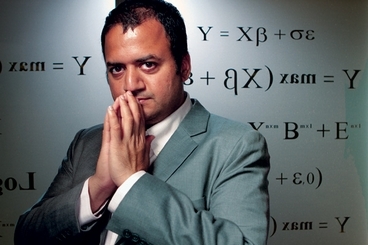 Mu Sigma founder Dhiraj Rajaram has been sued in the US for misleading an early investor about the prospects of the company. Patrick G. Ryan, who at one point held 17.5% of shares in Mu Sigma, claims that Rajaram cheated him of millions of dollars by downplaying Mu Sigma’s growth prospects, which caused him to sell back his stake for an amount much less than they were worth. Patrick Ryan’s firm, Walworth Investments, had invested $1.5 million in Mu Sigma in 2006 when it was still a startup and short of cash. In 2010, Mu Sigma bought back the stake that Walworth Investments had owned for $9.3 million. But Walworth Investments says that the shares were worth a lot more. The company claims that Dhiraj Rajaram deliberately portrayed itself to be struggling when it was in fact thriving and growing fast. Patrick Ryan says that Rajaram put “deceitful” pressure on his son, telling him that Mu Sigma had limited growth potential because it was on the verge of losing its biggest clients. “Only in hindsight did it become clear that Rajaram’s true objective was to gain back the ownership that he had been forced to share, and that, far from tapering off, Mu Sigma was growing geometrically.”, the company said in the court filing. Somewhat bizarrely, Walworth Investments also claims that Rajaram’s behaviour was driven by his devotion to Lord Shiva, whose core philosophy called for ‘destroying or selectively abandoning the past’. Dhiraj Rajaram has flourished since 2010, and with a net worth of Rs. 17,300 crore, is currently India’s richest startup founder. Mu Sigma too has become a unicorn and is currently worth upwards of $5 billion. A 17.5% stake in the company, even after dilution from subsequent rounds of funding, would’ve been worth a lot more than the $9.3 million that Walworth Investments sold it for.